I am having problems with Adobe Flash in Ubuntu, what are my options? 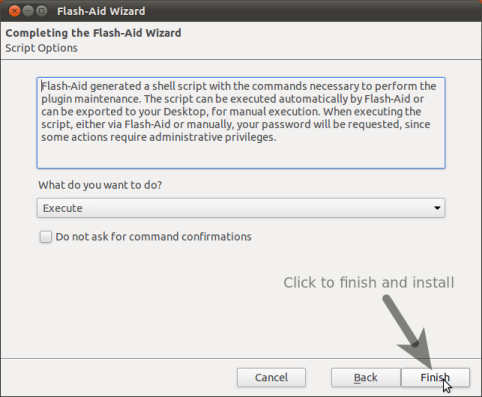 As you have identified - the best solution is usually to follow this Q&A to install flash. It does work for the vast majority of users. Flash-Aid was discontinued by it's author and is unknown if it will be back, the following are kept only for historical reasons. This will remove any remnants of of Flash installation and install flash directly from the Adobe Website. During the wizard installation you have a few configuration options that you can try to resolve flash-player issues. Close & Restart Firefox / reboot for the change to take effect. For Youtube this can be done by loggin in, going to http://www.youtube.com/html5 and enabling it there. You can also just add &html5=True behind each video URL. There is a trick for the cases when there appears to be no HTML5 option available on YouTube: use the "embedded" variant. For example: https://www.youtube.com/watch?v=3SacL219sic&html5=True appears to be not watchable in HTML5, but https://www.youtube.com/embed/3SacL219sic plays in HTML5! Whether your browser and the version you are using will support the HTML5 playback of a video on a site that provides such an option (like YouTube or VKontakte) will depend on the codec chosen by the site owners. For example, YouTube and VKontakte (a Facebook clone popuar in Russia) use different codecs for their HTML5 videos, which means that in Ubuntu 12.04 HTML5 video playback at VK.com works in Chromium, but not in Firefox (and in future, these browsers might swap their roles). I don't know for sure if this will work for you as well, but it worked for me. Install Flash Aid, restart Firefox, and click the Flash button at the upper right corner of Firefox's window. Just follow the instructions in the wizard and you should be fine. when having issues after an automatic update. This leaves one with Adobe Flash plugin version 11.2.???.??? 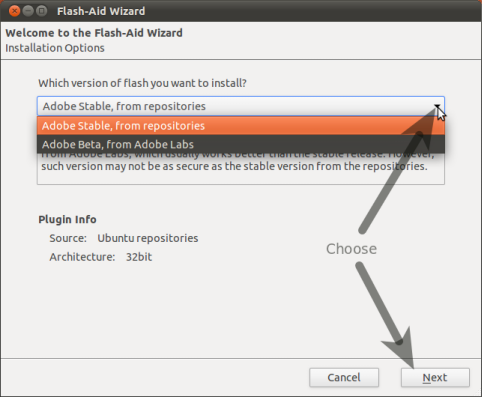 in Firefox as Adobe no longer releases any higher flash versions for Linux. For the moment, the 11.2 series of the Adobe Flash plugin for Linux is still maintained and security updates will trickle in automatically. However, one will miss out on innovations and power efficiency improvements. The latest and greatest Adobe Flash version for Chrome (version 12.0 at the time of writing) is installed in Chromium. 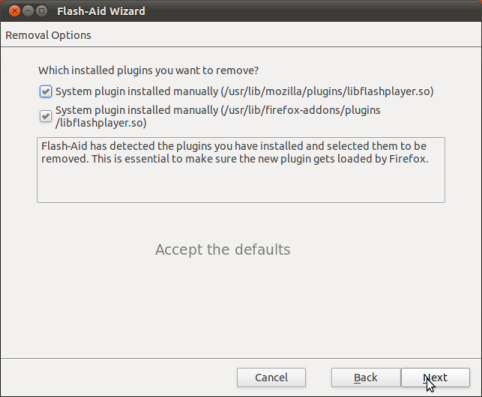 Unlike Firefox Flash, Pepper Flash is not updated automatically by the update manager; it requires a tedious manual process. Forgetting about this leaves one exposed to security threats. In general, this can be done on Adobe's site. Here is the full story nicely written up. I am running Ubuntu 12.04 64-bit with an Nvidia GeForce 8400 GS. I have been having the same issue ever since I corrected another Flash issue on my system related to Nvidia GPUs -- see Flash video appears blue on this forum. Following the workaround posted at the previous link stopped the unwanted behavior of all Flash video being tinted blue, but ended up causing the Flash plugin to crash nearly every time I attempted to watch a video online. First, not all sites provide HTML5 videos as an alternative to Flash (hopefully, there will be more). And second, whether your browser and the version you are using will support the HTML5 playback of a video on a site that provides such an option (like YouTube or VKontakte) will depend on the codec chosen by the site owners. For example, YouTube and VKontakte (a Facebook clone popuar in Russia) use different codecs for their HTML5 videos, which means that in Ubuntu 12.04 HTML5 video playback at VK.com works in Chromium, but not in Firefox (and in future, these browsers might swap their roles). And third, some videos might appear to not have the HTML5 option on YouTube. (For example: https://www.youtube.com/watch?v=3SacL219sic&html5=True.) But thanks to the answer by Klementine, there is a trick useful for getting at HTML5 playback in these cases -- use the "emdedded" variant. (For my sample video: https://www.youtube.com/embed/3SacL219sic.) And it works! Then, select "APT for Ubuntu 10.04+". A window should pop up prompting you to select a program to use the apt link: you need to direct it to /usr/share/software-center/software-center. This file should be a Python script. When it opens the Software Center, enable the source it tells you to. Then, once it is done, hit the install button. You may need to restart Firefox for it to work, but that's how I did it, and it worked for me! I managed to Enable the Adobe Flash plugin in Opera by following the instructions from this Russian post. Restart Opera. and you're done. Not the answer you're looking for? Browse other questions tagged firefox flash google-chrome chromium or ask your own question. 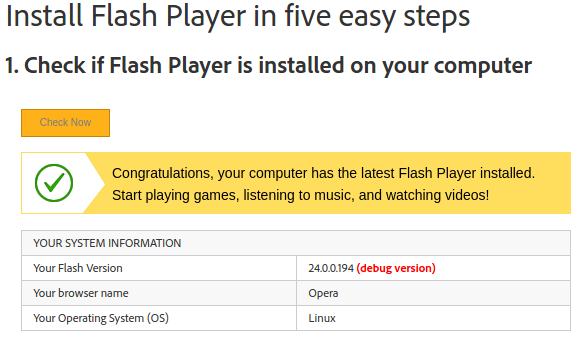 Flash Player plug-in could not be added to firefox or opera plug-ins! Is there any way to synchronize flash audio and video? 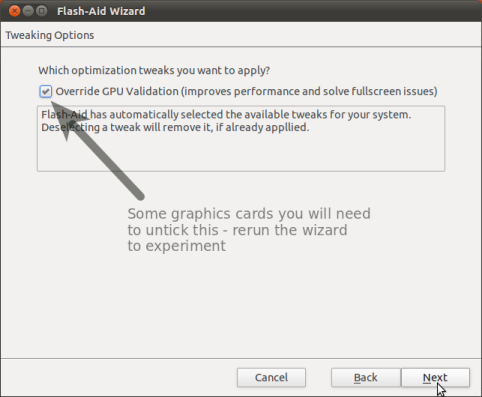 How do I install Adobe Flash for use with the Chromium browser (pepperflash)?